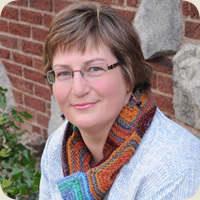 In 2005 Lorilee opened City Knitting in Grand Rapids, MI. Once she convinced customers that the large seating area was for them to use anytime, a diverse and welcoming knitting community sprang up. She believes the more curious a knitter is, the more accomplished they will become. After all, everything we know, we learned. She enjoys conveying knitting knowledge with patience and enthusiasm. Her own designs center around seamless geometric construction, and vertically-stranded color work. The designs she works make great use of some of the newer techniques such as magic loop knitting in the round. Lorilee is perhaps best known for her continental knitting tutorial on youtube.com which is approaching half a million views. It has helped beginners and decades-long knitters alike from all around the globe. When teaching this in person, she helps knitters minimize hand motion and improve consistency in tension. Lorilee studied Fine Arts in college, with an emphasis on printmaking and ceramics. For five years before opening City-Knitting, she sold art and organized shows for a regional art gallery in Grand Rapids, MI. Currently, Lorilee is working on a knitting pattern book and knitting technique DVD. In the Spring 2008 edition of Interweave Knits, she had a design published and also sells some of her designs on Ravelry. Member of TNNA, the National Needle Arts Association. For three years in a row, local patrons voted City Knitting, a shop Lorilee owned for five years, winner of "Townie Gold" for best yarn shop. Awarded best new business from the City of Grand Rapids in 2006. Lorilee studied Fine Arts in college, with an emphasis on printmaking and ceramics.